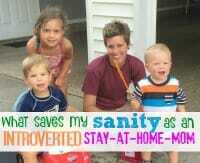 As someone with strong introvert tendencies, the decision to stay at home with my children was very difficult for my own personal needs. However, after almost 6 years of staying at home with small people who constantly touch me, talk to me, question me, and make SO MUCH noise, I feel like I’ve finally found some balance! Today I’m sharing a few things that help me! I know rhubarb isn’t usually the most exciting or sought after fruit around — but in our garden, rhubarb is by far the very first thing to pop up, and OH how exciting that is after a long cold Michigan winter of no flowers, no fruits, no veggies, and not even much sun. If you share my enthusiasm for rhubarb, you’ll most likely love these 3 simple and delicious rhubarb-filled recipes. I don’t usually blog about health or nutrition — mainly because I’m not super passionate about these topics. However, I AM passionate about simplifying overwhelming topics and concepts so they feel doable for us normal, average, everyday people. 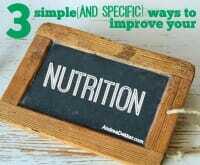 If you’ve ever felt overwhelmed by all the “don’t buy”, “never eat”, and “stay away from” advice from the “experts”, and just want a few simple ways to slowly start improving your nutrition, I think today’s post will be just what you’re looking for! Although it has been challenging for me to find my groove again after coming back from vacation, I’m feeling more productive, more efficient, and more “normal” again after a couple weeks at home. I tried a few new recipes last week, read a bunch of books, and found a some fun goodies on Amazon — I’m sharing all of that, and more, in today’s post! 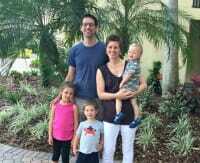 It’s been just over a year now since we finally got all 3 of our kids on a relatively decent sleeping schedule… and since then, Dave and I have enjoyed hours of kid-free time every evening. 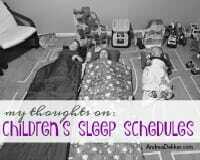 I’m often asked to share what exactly we did to get our kids to sleep better — and although I don’t have a specific 3-step or 5-step process, I hope that some of the thoughts I share in today’s post will help those of you in the thick of sleepless nights! I realize many of you might be thinking the title of this post is a joke… but I’m serious. Yes, I know you can’t literally “make-over” your entire home in 5-minutes — but you CAN make-over one drawer, one shelf, one cubbie, or one small section of your house in 5 minutes. Over the last 10+ years, I have used many different pots and pans, and I think I’ve finally figured out what I want/need from my pans, as well as a handful of features I really dislike. 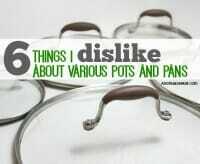 For those of you who share my enthusiasm for random product reviews (good and bad), I thought it might be helpful if I shared a few things I dislike about various pots and pans. I’d love it if you shared more in the comments! After 4 pregnancies in crazy West Michigan weather (all during different seasons of the years), I’ve found that it has been fairly easy for me to wear a somewhat minimalistic maternity wardrobe. 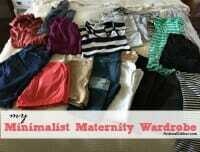 Today I’m sharing everything in MY maternity wardrobe and why it works so well for me! 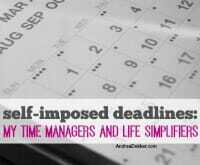 For as long as I can remember, I’ve set self-imposed deadlines for myself and my life — everything from school work and piano lessons as a child to blog work and home maintenance as an adult. I do realize that self-imposed deadlines might not work perfectly for every personality type… but they sure do have a HUGELY positive impact on my own life… and today, I’m sharing a few reasons why. I don’t know about you, but I always hate coming home from vacation to a messy home, piles of dirty laundry, and an empty refrigerator… so I took a few steps to make sure coming home would be a bit less depressing this time. 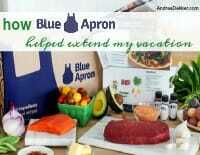 I cleaned the house before we left, did laundry the day before we came home, AND I scheduled a Blue Apron delivery the day after we got home, so I didn’t have to meal plan or worry about getting groceries! It was SO fabulous! Today I’m sharing a bunch of pictures from our trip! 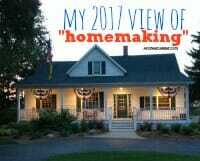 For me, “homemaking” in 2017 looks quite a bit different than it did years ago… and while I probably wouldn’t ever introduce myself as “Andrea Dekker, a homemaker” I’m also not ashamed to consider “homemaking” as a large and important part of what I do every day. After reading this post, I still don’t expect you to love it as much as I do — but maybe you won’t hate it! Over the past few years, Dave and I have dealt with our fair share of pest issues — everything from bats and bees to moles and mice. 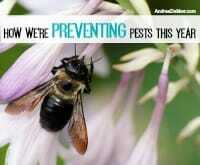 However, THIS year, we’re taking some preventative measures that will hopefully keep the pests out all spring and summer long. 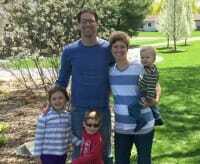 I’m also sharing how the act of “prevention” has helped me to simplify and de-stress my life! Almost all of us have some sort of issue or problem we struggle with on a daily basis… and sometimes we just need to vent. 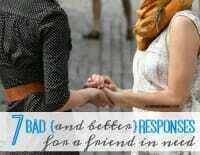 Inspired by a recent reader question, I decided to share 7 bad (and better) responses for when a friend (or spouse, or child, or other relative) comes to us to vent, to share a concern, or to ask for our advice. Today I’m sharing one of my favorite salad recipes — it has just the right combination of crunchy and chewy and savory and sweet. 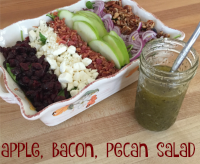 If you love “non traditional” salads, you’ll want to give this recipe a try. It works for almost any occasion, any holiday, and any season of the year! 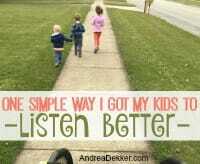 Today I’m sharing one simple thing I’ve been doing with my kids that has helped them listen to me so much better. Of course, they aren’t magically compelled to do everything I ask without moaning, groaning, whining, and complaining… but we are making progress, and that’s all I can ask for right now! It’s a new month… and I’m sharing a few new favorite things. Everything on this month’s list has a very low price-point, but they all make a huge difference in my daily life. 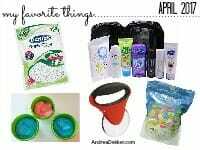 Come see what my favorite things are, and share YOUR favorites in the comments!